There’s a lot of truth to that. I’ve even been known to complain about my performance from time to time—last year was particularly bad—but I’ve found little to dislike about this year. The NE Season Opener tri (a sprint) was fast, and I had a solid performance. A couple months later during the Olympic-distance Mass State Triathlon, I put together a very good swim and run, which sandwiched a so-so bike. Last month, RAGBRAI put a lot of good distance into my legs; my morning swims at the reservoir have been top-notch; and I’ve been having fun putting together some “where does this street go?” runs around my neighborhood. (“Up a hill and down a hill” is the typical answer.) Plus, I had been training on a new saddle, which promised to make riding a bit more comfortable. So I was really eager to see how this season’s big race would go. 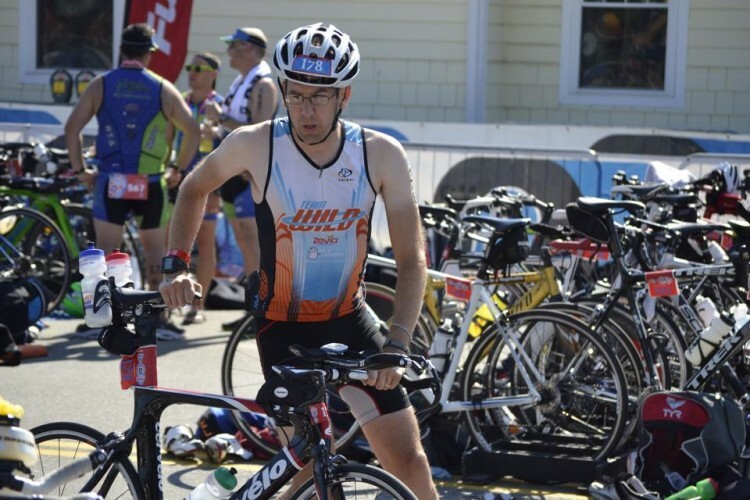 Two years ago, this race—the Rev3 Maine—was the first 70.3 I ever did. I trained hard for it, used a training plan from TeamWILD, and was ecstatic with my just-under-six-hour finish time. (5:58:36, for the record.) Since then I’ve done two others, the Patriot Half (5:38:42) and Timberman Ironman 70.3 (5:39:49). They’ve all been challenges in their own ways, which makes the results that much better. Today was challenging, too, but I’m pleased to say that the results were worth the difficulties. 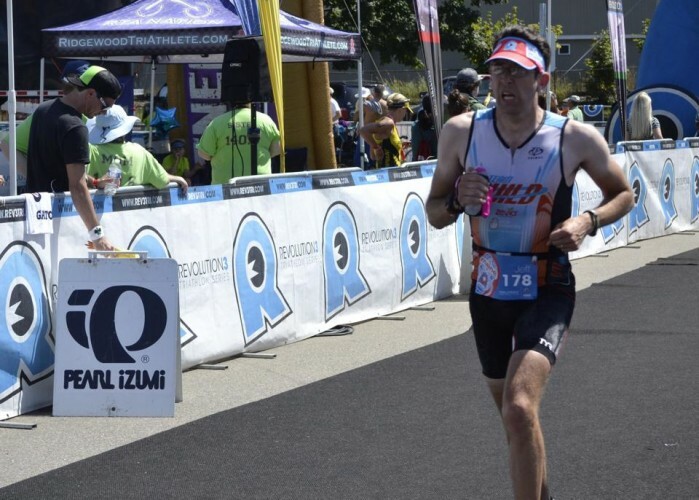 I set a new PR at the 70.3 distance with a 5:33:33! The faithful reader will remember that I had a problem with very high blood sugar at last year’s Timberman. I started the bike with a 286 mg/dL (15.9 mmol/L) and quickly climbed to 367 (20.5). Micro-boluses of insulin on the bike brought me to a place where I felt okay to head out onto the run without risking my health. Since that time, I’ve tried to work on my insulin strategy, but I’ve still had a lot of highs during my early morning bike rides and after my swims. It’s been quite aggravating; in fact, much of my experience with diabetes recently has left me frustrated. My endocrinologist and I worked out a plan to address some of these issues, which will hopefully help with the early morning exercise (when I go up a lot) and afternoon outings (when I drop like a rock). Today, I thought I would try the same thing that I did during the 2012 race, with the addition of a small meal six hours before the race. So I made a peanut butter sandwich, put it in the kitchenette’s fridge, and set an alarm for 1:00AM. In addition to this (which got a full dose of insulin), I had my usual ClifBar breakfast and a much smaller dose of insulin ten minutes before the swim. The swim was great! 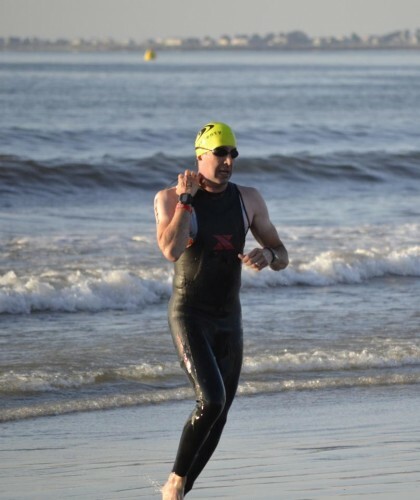 I felt really good during my practice swim on Saturday morning, and I proved that it wasn’t a fluke during the race. Two years ago in similar conditions (64ºF, small swells, clear skies, and light chop) I swam the 1.2 miles in 45:24. Today: 35:20! It’s nice to see all of the hard work at the pool paying off. About 15 minutes into the bike, I tested my blood sugar. 254 (14.1). Not great, but only slightly higher than the beginning of the swim. I’m not 100% sure why I didn’t check my CGM or retest along the rest of the 56-mile bike course, but I suspect it had something to do with the strength of the field. Last time around I felt like I was passing more people, and this time I felt like I was chasing the whole way. I should have swallowed my pride about continually leap-frogging people and just tested, but I didn’t. I finished the ride three minutes faster than 2012 (2:54:53). Basically a draw. There were some dark moments on the bike. My legs hurt in ways that they usually don’t, even though I was following my typical pace plan. In particular, my inner thighs were burning. When I got off the bike my whole lower body just felt painful. Those three hours felt terrible. In the bike-to-run transition I chatted with Lisa while putting on my shoes, and she could tell that something wasn’t quite right. I tested my blood sugar as I headed onto the run course: 405 (22.5). For those of you without diabetes, this is quite high. It’s higher than I was when I was admitted to the hospital at the time of my diagnosis. When I’m not exercising, it’s around the point where my stomach starts to turn and I get very grumpy for no good reason. Today, it was high enough to make me wonder whether I was producing ketones, especially since I had to pee twice in two hours. Meanwhile, I was managing to keep the pace that I had planned to hold during the 13.1-mile run. Last week, I went to the high school track to work on my pacing, and I threw down a 10K at a consistent 8:00/mile (5:00/km) pace. Twenty-five dizzy laps at two minutes each, noting my heart rate along the way. If I could keep my heart rate around 140 BPM, I figured I could have a very good day. As the first few miles ticked by, I started to lose the anger I was carrying, and the running got easier. At the turnaround point I was still on a very good pace of 8:40/mile (5:25/km), my CGM had double down arrows, and I started eating again. It would be great to say that I ran a half-marathon PR today. Alas, I did not. Instead I finished it in 1:55:05, about 8 minutes off my best. Still, that’s 10 minutes faster than my previous race here, and I ran the last mile at 7:30/mile (4:40/km) pace . . . much to the chagrin of the people I passed along the way. Now the off-season is upon me. I was reflecting as I sat around after the race that I need to work on two things before the Ironman next year: my bike strength/speed and my insulin/nutrition plan. Fortunately, I have a whole year to get that squared away. Until then, I’m going to keep having fun and working through the (occasional) dark nights of the diabetic triathlete’s soul. 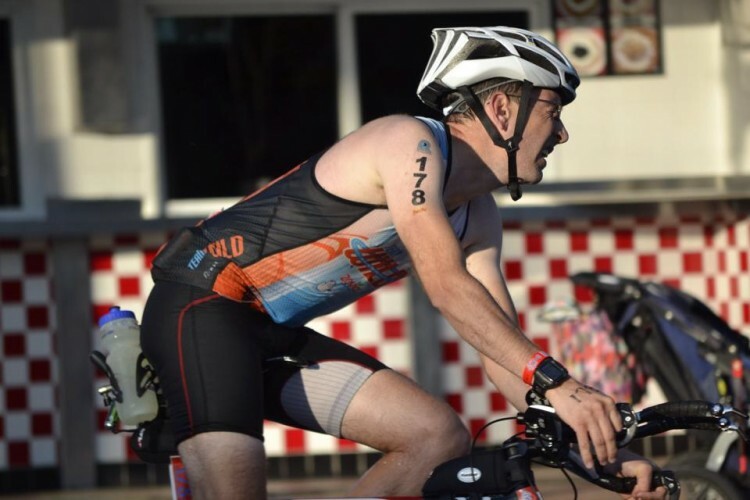 This entry was posted in 101 in 1001, Cycling, Reluctant Triathlete, Running, Swimming. Bookmark the permalink. y’know I’m not much of a fan of triathlons and I will be the first to admit I just don’t get the draw to them. HOWEVER… I do love reading about race reports from diabetic athletes. Mainly only diabetic athletes because I find it amazing that you can do that. Its such a long long race with different disciplines. Its actually the hardest thing one can do with diabetes IMHO. It’s so much more real when you add diabetes into the mix. I’m very proud of you! what an awesome PR! Shame about the diabetes but it got turned around because you did the right things. I can only hope your next big race goes a bit better on the diabetes front because your athletics are SPOT ON!!!! Congrats on the PR! For what it’s worth, I find the nutrition/insulin thing the hardest part to deal with. Even harder than training. Way to push through to the end. yah, congratulations on the PR, woo!